SYNGENE’s latest gel transilluminator is equipped with two banks of LEDs to provide excitation at the mid-blue wavelength of 470nm, making it suitable for use with the latest non-toxic DNA stains. The UltraBright-LED is described as a new generation of blue light transilluminator, compatible with dyes that excite at 420-480nm, and providing a safe alternative to UV when working with non-toxic fluorescent dyes. Among the appropriate dyes for use at this wavelength are including Syngene’s UltraSafe Blue, SYBR Safe, and GelGreen, and protein stains such as SYPRO Ruby and Pro-Q Diamond. The system also works with ethidium bromide, although this may be considered hazardous. When used with non-toxic stains, the blue light means that researchers can use UltraBright-LED directly on the lab bench, where it takes up little space. 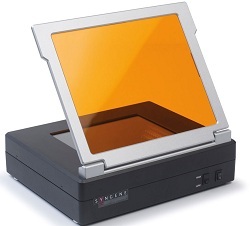 The filters in the lid enhance band contrast, but if necessary the transilluminator slides into the Syngene G:Box imaging system for visualising faint bands – thereby facilitating precise band cutting and the production of high quality images.